The lightweight citylife is the perfect pushchair for families on the go. With a smart one-hand fold, compact folding size, a large shopping basket, fully suspended wheels and a push-push brake system the citylife meets the highest standards in termsfort, quality and versatility. The ergonomic seat unit is suitable from 6 months with a 5-point harness, adjustable back and footrest, the citylife pushchair is perfect for active families in urban areas. 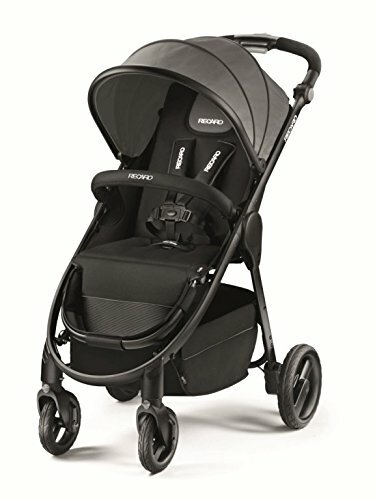 Bination with the recaro carrycot or privia (using adapters) the citylife can turned into a travel system to be used from straight from birth. An intuitive one hand folding mechanismpact, lightweight folding size allows you to travelplication and everyday life a little bit easier. A push-pushfortably locks and release’s the brakes. The citylife has smooth-running 360ç swivel wheels with full suspension and continuous, adjustable handle to guarantee easy one hand manoeuvring. No more flat tyres: a robust mix of materials makes the wheels puncture proof and guarantees a smooth ride. A large and easy access shopping basket allows you to pop to the shops no problem andes with a raincover, cup holder and bumper bar as standard.